The German-born PEGIDA movement, which lobbies against the Islamization of Europe, has attracted hundreds of supporters and opponents to the streets of Vienna for its first march in neighboring Austria. The faceoff between the sides was avoided with a heavy police presence. One thousand two hundred officers had been deployed to maintain public order in Vienna. 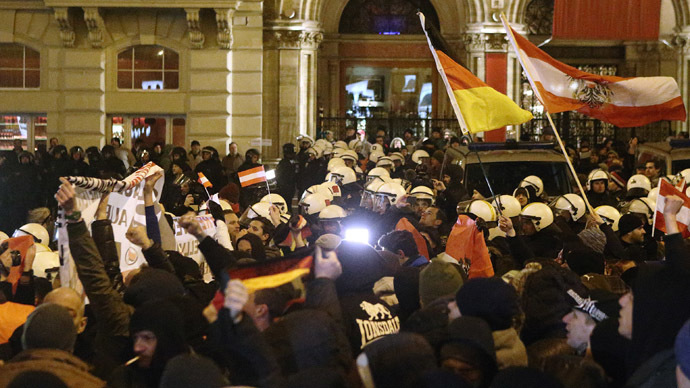 There were no incidents or arrests during the rally, an Austrian police spokesman told Reuters. A spokesman for the Austrian PEGIDA offshoot, Georg Immanuel Nagel, told Die Presse newspaper that the time has come to end the “appeasement policy” for Muslims in the country. He believes that Austria should introduce a legislation banning “Islamism” so that those promoting Shariah law could face punishment in the same way the glorifiers of Nazism do. Around half a million Muslims currently reside in Austria, which has a population of 8.5 million mostly of Roman Catholic faith. The PEGIDA rally took place just a few days after violent demonstrations by left-wing activists, who were protesting against an annual ball in Vienna organized by right-wing politicians. Around 5,000 people took to the streets on Friday, with police making 38 arrests near the Hofburg palace. Islamophobia has recently become a hot topic in Austria after a series of attacks on Muslim women wearing head scarves in Vienna. The incidents occurred following an announcement which stated than over 170 people from Austria went to Iraq and Syria to fight alongside the jihadist group Islamic State (formerly ISIS). In order to tackle the spread of radical Islam, the Austrian government came up with a draft law requiring standardized German-language translations of the Koran and prohibiting foreign funding of Muslim organizations on its soil. In Germany, the PEGIDA movement has been holding protests every Monday in the eastern German city of Dresden since October, as well as in other major cities. The rallies, which initially gathered no more than 500 people, hit record attendance levels of 25,000 following the Charlie Hebdo Islamist attacks in Paris in January. They have since broken out of Germany, with minor rallies taking part in Denmark. The PEGIDA manifesto states that the group is against any form of extremism, and its leaders have been trying to move from the fringe of political discourse and cut ties with far-right groups, including neo-Nazis. At the same time, the group remains at the center of controversy in Germany, with top politicians, including Chancellor Angela Merkel, labeling it “xenophobic” and “racist,” and with media looking for various members’ Nazi ties. Recently, de-facto PEGIDA leader Lutz Bachmann had to resign after a photo of him posing as Adolf Hitler was found and posted by the regional Dresden-based newspaper, Dresdener Morgenpost. Bachmann maintained that the picture was a satire. Despite condemning the increasingly popular movement, officially, Berlin has upheld the right of PEGIDA to gather rallies and marches as it stands in line with the country’s fundamental freedoms.